If you've never thought about the benefits of journaling before, I'd like to give you a few advantages to consider that just might help give you a "good enough" reason to get started with a Christian journal. For that reason, I'll give you my favorite benefits and then, hopefully, you'll share your own journaling benefits that I may have overlooked. Deal? 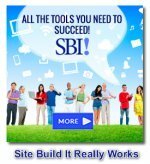 Journaling For Self Discipline - Most of us fall a bit short in the area of self discipline in certain parts of our lives. For many of us, one of those areas is in the matter of personal devotions. Life just seems to get busier and busier each and every year. Since God isn't loudly demanding our attention like so many other things do in our life, it's quite easy to let our time with Him fall by the wayside. Or maybe you're a bit like me. I make sure I spend some time with the Lord each day, but I can't always claim that it's quality time. Occasionally I find myself rushing through my Bible reading to "get it done" which really defeats the whole purpose of reading God's Word in the first place. Having a Christian journal is a good way to help you get some structure in your time spent in the Word of God. One of the benefits of journaling is that it almost makes you stop and think about what you are reading so that you can write the application that the Lord has given to you each day. That leads me to the second benefit of journaling. Journaling For Spiritual Meditation - I've always believed that it's better to read through the Scriptures without giving them much thought than not to read through them at all. :) However, it's BEST to meditate on God's Word! Some people find the idea of meditation a bit scary because of all the negative connotation that goes along with the new age movement, etc. That type of meditation is dangerous and to be avoided. Having said that, don't let that put you off, because true meditation is a very God honoring activity. Meditation is not emptying the mind of all thought, but rather taking a thought and really thinking deeply about it. ~ Who is this talking to? ~ What were the circumstances surrounding this situation? ~ What lesson can be learned from this that I can apply to my own life? ~ Am I guilty of this behaviour? ~ Is this something I need to work on? Journaling For Stress Relief - As funny as it may sound, another one of the benefits of journaling is stress relief. How does journaling relieve stress? I suppose it's not really the journaling itself as much as it is the act of sitting quietly for a long enough period of time to read the Bible, meditate upon it, and write down your thoughts. This process brings a calmness to your spirit and allows your mind to have a relief from all the stresses that you may be dealing with. 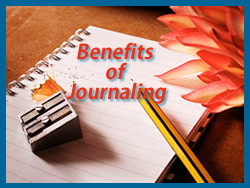 Journaling For Healing - The last of the benefits of journaling that I want to mention is journaling for healing. Yes, this could be physical healing in some cases, but it's more than that. Let me give you an example. When the Lord took my mother and dearest friend to heaven in 2010, I was devastated and full of grief. It was only through my close relationship with the Lord and the comfort of my good husband that I felt able to heal from this grief and continue on in joy. It most certainly didn't happen over night. It takes time to heal, whether it be in body or in spirit. But the Lord is our Great Physician, and it can be very helpful in the healing process to write down your thoughts and feelings in a journal as you are going through each trial. Search out the Scriptures that are specific to your own situation - and there WILL be some. Ask the Lord to bring you spiritual and physical health and healing through His Word. I'd love to hear your story of how journaling for healing has helped you. I hope as you review these four benefits of journaling, you will be encouraged to give spiritual journaling a try. Pick up a pretty (or handsome) :) book to use and carve out a little time each day to get alone with the Lord and begin your journaling journey. I'm confident you won't regret it. Have you kept a Christian journal in the past or perhaps are journaling even now? How has the experience inspired you and helped you draw closer to the Lord? Tell us all about it and share your favorite journaling ideas. 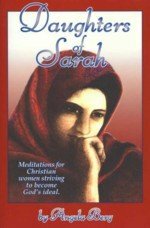 Meditations for Christian women who are striving to become God's ideal. 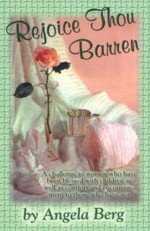 A challenge to women who have been blessed with children, as well as comfort and encouragement to those who have not.